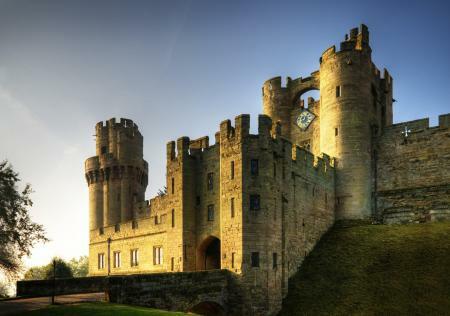 Take a trip back through the last eleven centuries to Warwick Castle, the site of a Saxon fortification, a wooden motte and bailey constructed in 1068 and a medieval stone castle. Restored and managed by the Merlin Entertainments group, the Castle uses multimedia experiences and costumed guides to bring history to life for visitors of all ages. Romiley Whitworth visited Warwick Castle with her daughters Niamh, 8 and Erin, 5 and was dazzled by the number of shows and interactive historical experiences on offer. A day at Warwick Castle is a chance to visit a real castle and get to grips with a lot of history and interesting facts. All staff are dressed in medieval costume and are always in character (we got asked to turn our ‘speaky boxes off’ when we went into one exhibit!) so there is a real sense that you have journeyed back in time. There is a great variety of outdoor displays and smaller indoor exhibits which offer fun-based learning. We went unprepared in terms what to see, but there’s such a lot to pack in, it might be a good idea to plan the day beforehand as the website provides all the information you need. You could plan the order in which you see the outdoor shows, make sure you make time to get the timed entry tickets, etc… But do keep in mind that when the big main events are on (for example, the jousting) the rest of the site quietens down a bit, so make the most of it (for example, we visited the castle at 1.30pm when the jousting show was on and there were literally only a handful of people inside!). The day as a whole was very inclusive and there was something for everyone in the attractions happening around the site. My youngest really enjoyed the Princess Tower experience, an interactive story session where the audience was called upon to release Guy of Warwick from a curse so he could live (‘happily ever after') with Princess Felice. My 8 year old enjoyed it too, especially as she solved the riddle! The session was no longer than 15 minutes and there were only about 20 children admitted (it’s quite a small room) so it had an intimate, ‘real’ feel. Time Tower – this is new from Easter 2015 and again, as with most of the attractions at Warwick, offers something for everyone. You enter a room in small groups and a video takes you back in time to when Warwick Castle was first built, explaining its place in history. You move through a series of three rooms until you get to a wall of pictures of all the people who have owned the castle; as the images are digital, they all start to interact with each other and offer a really fun and interesting recap of the history of the castle. The Castle Dungeon is very popular (note there is a £9 per person extra charge; tickets are available on the day or can be purchased in advance) but is recommended for over 10s only, so we didn’t get to see it. It's a 50-minute walkthrough experience with live actors and special effects; lots of gore and scares mean that younger visitors aren't admitted. The Kingmaker area aims to help visitors experience the sights, sounds and smells of medieval England and is of particular interest to swords and shields fanatics! 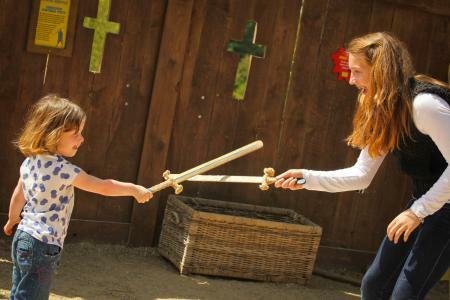 There were a couple of areas around the site where you could pay £5 to learn to fight like a knight or have a session with a bow and arrow – we didn’t do this, but plenty of KS2-aged kids were giving it their all! 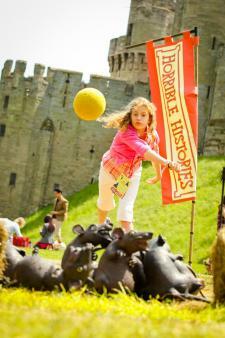 Special Horrible Histories events, held during school holidays. Medieval Mayhem was really good, engaging fun and both of the kids got stuck in. They loved ‘Splat a Rat’ and the medieval operation game. The Foul Fragrance area had them in stitches and the revolting medieval toilet sent them pale (it had sound effects too...). There were also a few characters on the site who shared disgusting anecdotes… really well done and exactly what you’d expect from Horrible Histories! The Warwick Castle entrance ticket includes tickets to a number of different shows, including Warwick Castle UNLOCKED (search for a shy ghost, explore a deadly bear’s lair and smell foul medieval sludge! 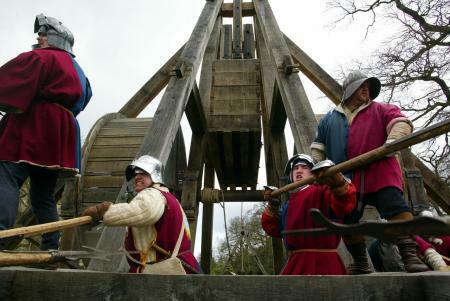 ), the Bowman's Show, the Trebuchet Show and a birds of prey display. The shows, as well as being really interesting and good fun, offer a chance to eat your picnic and rest your feet! We took a picnic with us as the weather was fine and the nature of the attractions meant we would be sitting outside so that worked well. There are lots of picnic benches available, but we chose to sit on the grass. Throughout the site are lots of kiosks selling the usual variety of sandwiches / burgers / hotdogs / fish and chips – prices starting from £5. The Conservatory Teahouse offered a more peaceful venue for lunch or coffee and cake, overlooking the Peacock Gardens. There are also two other family restaurants. Warwick is in the Midlands, with easy train access from London and Birmingham. The Castle is well signposted and less than two miles from junction 15 of the M40. Family tickets (2 Adults & 2 Children) start at £53.55 (if you buy in advance online, saving around 25%), with under 3s free. Opening hours vary according to season (though the castle usually opens at 10am and closes at 5pm), so always check online before you travel. There were lots of ‘shopping kiosks’ around the site selling themed items – my girls picked a sponge flail and truncheon which were less than £5 each. The usual stationery-type items are under £2, so the pocket money clientele is catered for. 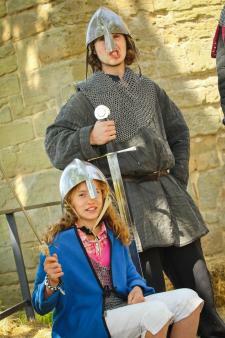 There were, however, some very pricey wooden swords and outfits on offer, so parents... watch out!